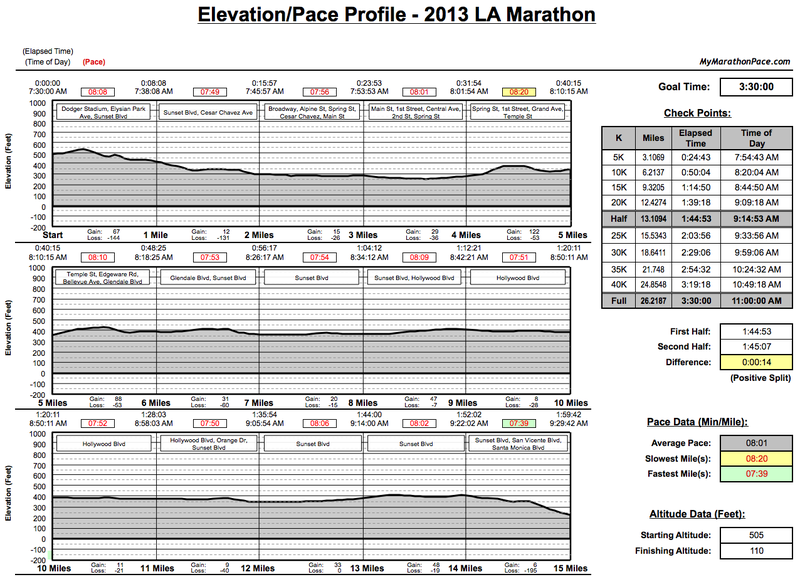 After a few weeks of trying out the Hansons marathon training plan, including 4 weeks of @40-mile totals, the "official" 18-week training plan for the March, 17, 2013 Los Angeles Marathon has finally begun. Countdown to race day: 123. The first 3 days of the Hansons plan actually calls for....off days. I had started my speed regimen along the Hansons plan three weeks ago, with 400-meter interval repeats X 12, then 600mX8, then 800mX6. The intervals are run at 5K-10K paces. I am definitely finding the speed days to be the least exciting regimen: running around a track, counting the quarter laps, laps, repeats. Not to mention the intervals are tough. Today, it was pouring pretty hard in the afternoon, so I decided to do the speed work on the treadmill. 1 mile warm up, 1000m X 5, 1 mile cool down. Instead of podcasts and radio, I had Arrested Development to keep my mind off the monotony (and even off the count: I think I missed out on a half lap somewhere....). I don't feel as sheepish doing my speed/interval days on the treadmill. For someone training for long distance runs, I look at these days as cardiovascular workouts. Running on the track has that even, smooth, artificial feel anyways, which is not too far off from the feeling of running on the treadmill. The exciting thing for the LA Marathon planning: I found mymarathonpace.com, which has a pace planner tailored to the contours of many popular marathons, including LA Marathon. I purchased the program and it may prove to be very useful. I could adjust goal time, pacing strategies (fast/slightly fast/slight slow/slow start, fades, positive/negative split, etc.) 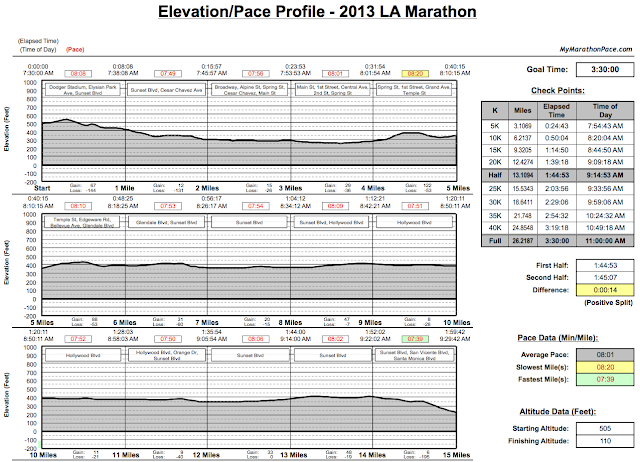 and the suggested paces are matched to the course profile. While there are other pacing programs, I have not seen another that matches the profiles as well as this program by Greg Maclin. He was also very helpful in helping me with the technical issues of the program. LA Marathon course, from Dodger Stadium to Santa Monica, takes runners through many of the highlights of the city and should appeal to natives and tourists alike, without resorting to the cookie-cutter, manufactured "excitement" of the Rock 'n' Roll marathon series. It also has a few quirks in terms of the profile: starts out with a downhill, then a steep then moderate hill, then rolling, then a big drop, then gradual uphill....in short, not as flat and novice-friendly as the LA Marathon vibe might suggest. Properly pacing the start is not as easy as simply following the "start off slow and warm up later" adage. It would be a shame to not take advantage of the downhill and go against common sense and "bank" some time. I believe it's OK in this case, since the usual "time-banking" involves running harder than average pace; in that case the body is not yet at an efficient state and the time banked will need to be paid back (often with interests!) but in this case if I time the pace just right I can run easy and still bank 10-20 seconds a mile from the start without burning excess energy if I just let the hill carry me. This profile actually starts right from my front door. I plan on doing this run more as the marathon approaches and try to find that easy groovy feeling, gliding without braking down a hill, right from the start of a run. I find it's easy to run fast downhill but not easy to run smoothly and fast to avoid beating up the legs. Hard to imagine the "official" training has only begun: this run, this course has been occupying my attention and my training for many months already! Hi Nancy: Thank you! Are you training for LA Marathon, or other races?